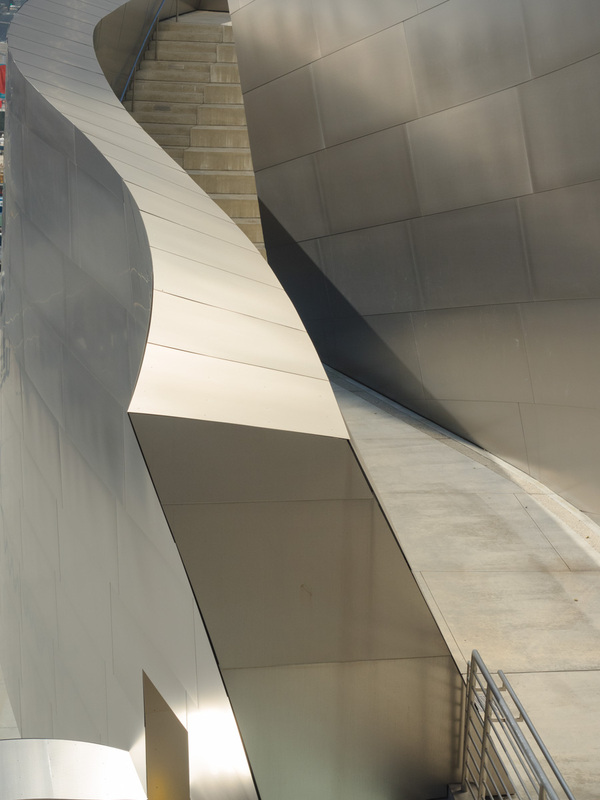 On a recent trip to California I had the opportunity to spend a little time (too little) at the Disney Concert Hall located in downtown Los Angeles. 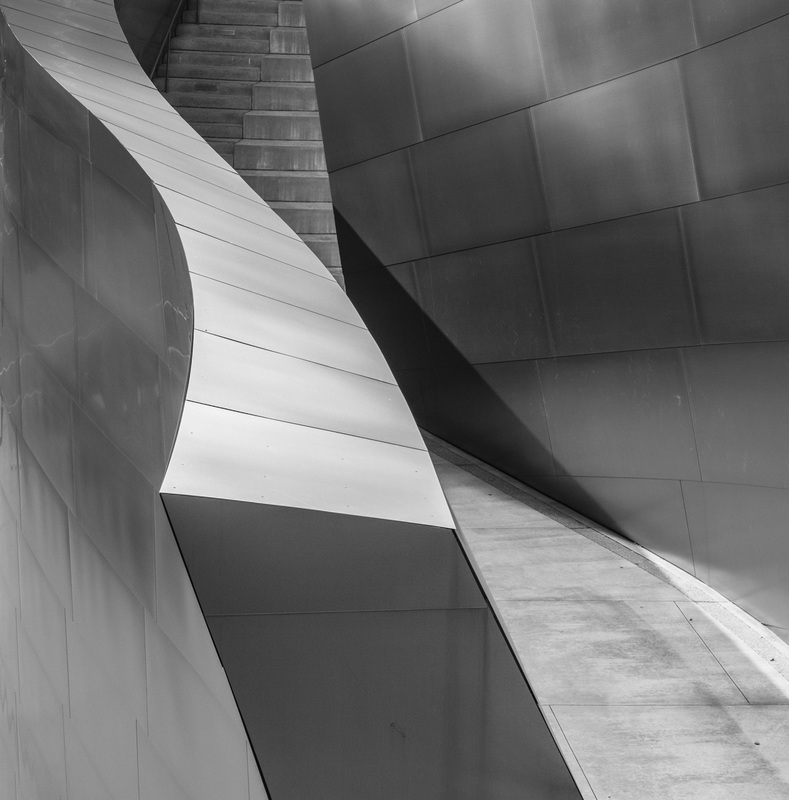 The building was designed by Frank Gehry and completed in 2003. The exterior of the building is clad in metal panels, with no two panels being the same size or shape. The end result is a building which ‘flows’. It also provides a photographer with almost infinite ways to shoot the building and still come up with something unique and interesting. I was able to make at least one trip around the building, and the only place that gave me trouble was the side that was away from the sun and mostly in shade. Other than that I was able to get interesting images from almost all locations. Of course I do need to go back and shoot the building at different times of they day, but I was pleased with the shots I got, given the short period of time I was able to spend at the building. One thing I did for this trip was to travel light. Instead of bringing my big and heavy Nikon (and assorted lenses) I just brought my Olympus OM-D E-M1, the 12-40mm f2.8, a rented Lumix 9-18mm and a fisheye. In the end, I used the 12-40mm almost exclusively. This was my first time really using this camera extensively. One of the features I really enjoyed using was the Electronic View Finder (EVF). Since I generally convert my architectural images to black and white I utilized the ability of the Olympus to show me the image in black and white as I was composing and shooting. I also wanted to try to shoot in square format, and once again I was able to set the camera up to show me the image in the square format. To make things simple, I configured a ‘myset’ to switch the camera to a square aspect ratio and to use monochrome mode. I assigned a function button to let me toggle that mode on and off. I saved the files in both JPEG and RAW so I always had the option to use the full frame color version if I wanted, and to give me more control over the final black and white image instead of just using the JPEG produced by the camera. In general this worked out quite well. The only thing I didn’t like was that the ‘myset’ also kept the ISO setting that was in place when I saved the setting. Every time I turned on this mode, the camera would change to ISO 400. Sometimes that was fine, but in many cases ISO 400 was not needed and I would have had better picture quality had I shot at ISO 200. Sometimes I noticed this, but sometimes I didn’t. The image above was created from the RAW file with some very minor modifications to the cropping of the full size image. The image below, shows the RAW image straight out of the camera. I think you know of my love for Gehry building James. This is wonderful! Jealous! I can’t wait to shoot at this building again. This was my first chance and I only got a little bit of time to shoot it. It certainly presents many different ways to shoot it.